mountain apartment located on the 2nd floor of a beautiful old building, very bright with entrance + 1 bedroom with a double bed, a room with 4 beds (2 bunk beds), a living room with a sofa, a kitchen (with dishwasher) , oven and gas fire and microwave oven), a bathroom (with shower, washing machine, and sink), a separate toilet with sinks, baby equipment (baby bath + foldable baby bed + backpack baby carrier ). In the basement ski locker. The apartment is in the heart of Cauterets, near the shops, the carousel and children's park, cinema and swimming pool, just steps from the thermal baths of the Rock. Ideal for couples with children or adults who want space. Cauterets tourist office dynamic and helpful. Many activities proposed for all ages. Cauterets is everything we wanted. The mountains are beautiful, the town is small and easy to get to and get around, and it isn't horribly expensive. The ski area of Le Lys was perfect for us beginners. The day before our arrival the owners emailed and called me to say the boiler had broken and that it would not be repaired by the following day (it was Christmas). They booked us into another apartment through the agency and it was very comfortable and actually larger than their own. Therefore I cannot review the apartment but I can say that the owners, Sylvie and Marc, were very good at communicating with us and dealt with the problem swiftly and effectively so that it did not impact us at all. A word of advice: indeed as in the listing, towels and bedsheets are not provided. We had to rent them from the agency and it was very expensive (€20 for a pair of sheets and a towel). Pillows and duvets were in the apartment, but the agency didn't even have pillowcases or duvet covers. We had to use t-shirts to cover the pillows and the agency didn't seem to understand our frustration. A clean, bright apartment in the centre of Cauterets, with great views over the town, equipped with everything you need. The dishwasher, washing machine/dryer were very welcome. There is free parking within easy walking distance and we never had a problem finding a space in August. Sheets are not provided but can be hired from the Agency Square Habitat (next door) who look after the apartment. Pillow Cases/towels are not available so do bring your own. Internet can also be arranged at an additional cost through the Agency. Restaurants,cafes/bars, supermarket, daily indoor food market, literally everything you need is a few steps away. Only French Channels available on T.V and as this is an older building there is no lift. Cauterets makes a perfect base for exploring this area - Cirques, Pic du Midi, Pont D'Espagne etc all easily reachable. 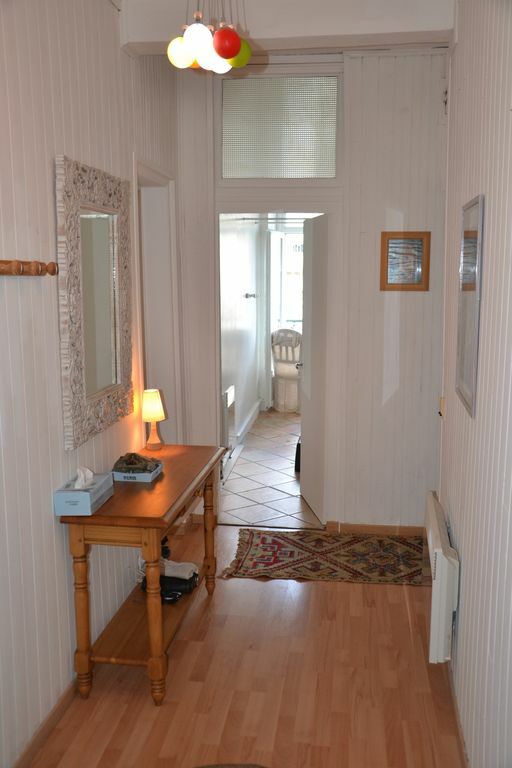 We thought the apartment was good value for money and recommend it for a pleasant stay in Cauterets. A fully equipped apartment, well managed, and a real pleasure to come back to after a long day's hike in the mountains. Lovely view over the town and the mountains, easy place to relax with a drink. I'd go back! Joli appartement, très bien situé et bien équipé. Les finitions de la salle d’eau pourraient être améliorées et les petites poêles du service à raclette mériteraient d’être changées. Grands-parents, papa et enfants sont revenus emballés de leur séjour. Appartement idéalement situé au cœur du centre-ville avec navette au pied de l’immeuble!! Nous avons passé une très belle semaine et avec un temps magnifique en prime!!! Nous avons passé de merveilleuses vacances ! Appartement très sympa et agréable à vivre pour nous qui étions 4. Emplacement parfait proche télécabine à pied, et au coeur de la ville. Cauterets est très agréable et familial. Le seul hic a été la neige qui n'était pas vraiment au rdv ( entre le 29 décembre et le 5 janvier) : 70% des pistes ouvertes avec verglas, cailloux par endroit... Mais les enfants ont pu profiter pleinement de leur cours de ski malgré tout, le temps a été magnifique toute la semaine et donc nous avons pu faire balades et randonnées magnifiques ! Heureux que vous ayez passé de bonnes vacances avec détentes, bol d'air pur et de nature.